I would usually post nice photos of the currently stellar-in-the-garden foliage to mark the monthly foliage fanfare that is Garden Bloggers’ Foliage Day, but since it’s also National Pollinator Week in the U.S., I’d like to remind gardeners everywhere to look beyond mere surface of leaf beauty to something deeper, and even profound, in the garden. In my garden this month, there are certain leafy greens that are being munched. Oh my!! Should I fret? Should I swear? Should I throw in the trowel and give up gardening entirely? Or instead, should I celebrate the life cycle of pollinators who lay their eggs on host plants and then accept that at certain times during the growing season, some of my plants’ foliage will be less than flawless because of insect-eating damage? I think I’ll go with that plan. 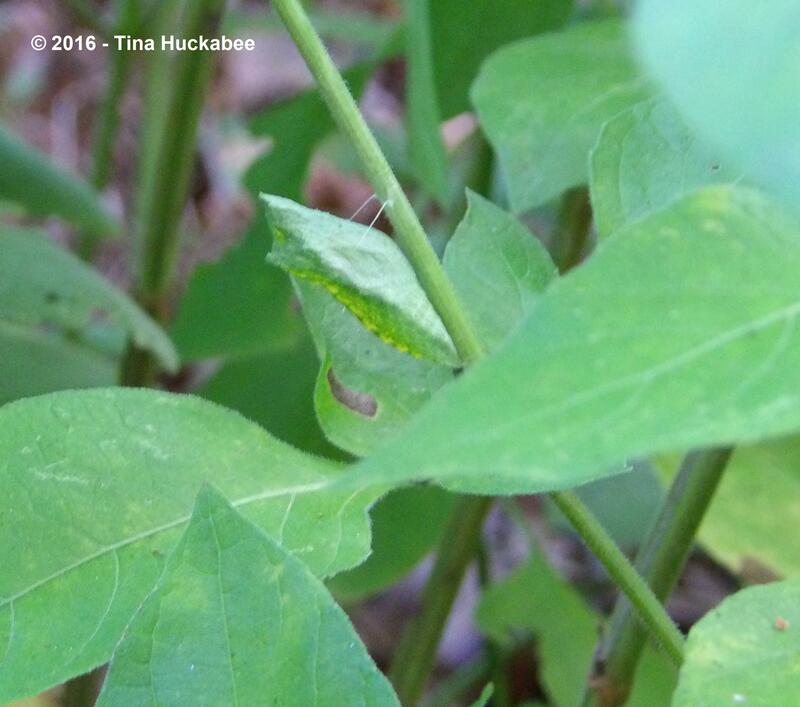 The host plants of many pollinators (butterflies and moths species in particular) serve as ready-made food bars where the leaves and stems host the incubation period of the eggs, and then once hatched, are munched by the larvae. Eventually, the larvae, after consuming their fill of the required greens, morph in their beautiful adult stage. Yes, fennel foliage is fabulously beautiful in June’s sunshine. But so are the Black Swallowtail, Papilio polyxenes, caterpillars that are devouring contentedly. The same butterfly, with dorsal (top) of wings in view–still drying. 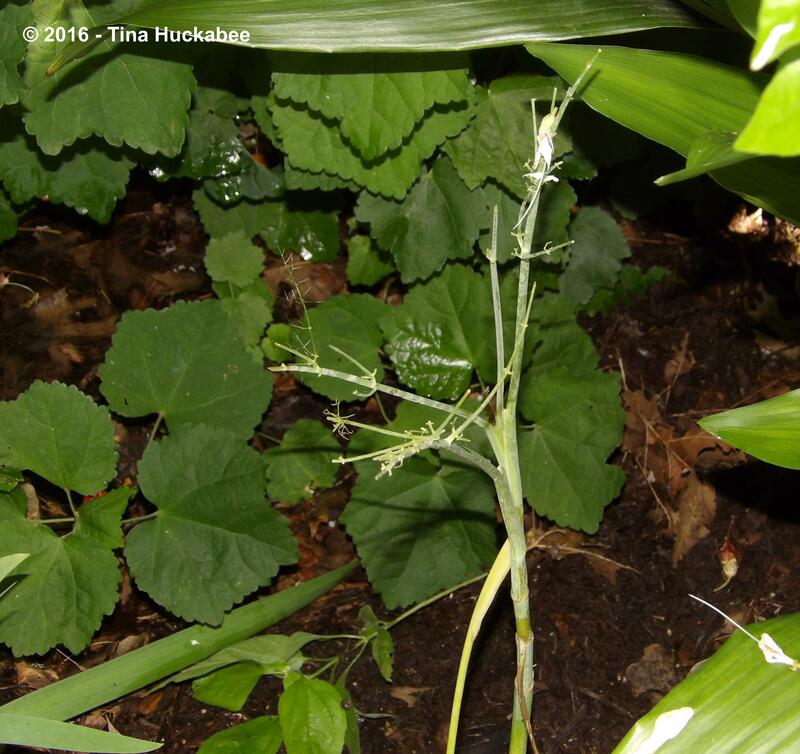 …to this: the spare, stripped stems and leaves, and yes, less lovely foliage, that is fennel after the larvae feeding. 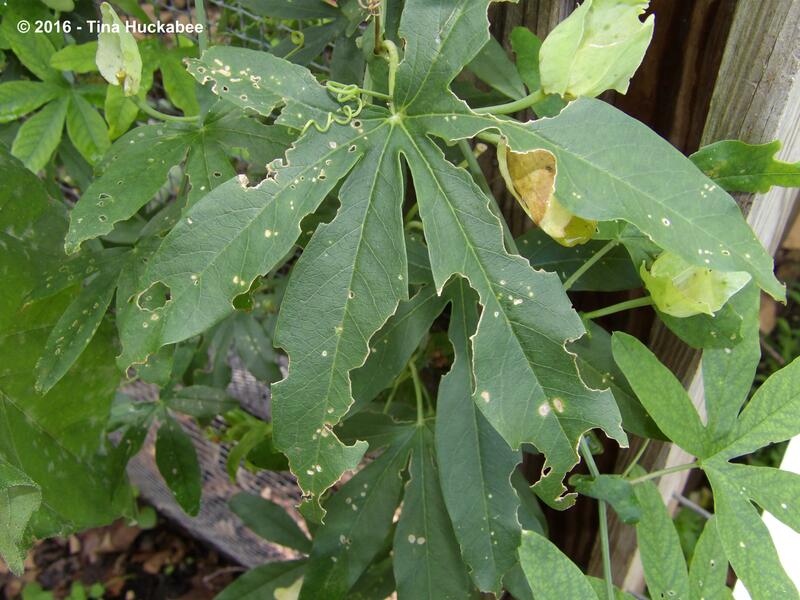 None of my butterfly host plants (I grow about a half-dozen) have ever experienced too much munching damage to the point that the plant(s) didn’t return to full health. 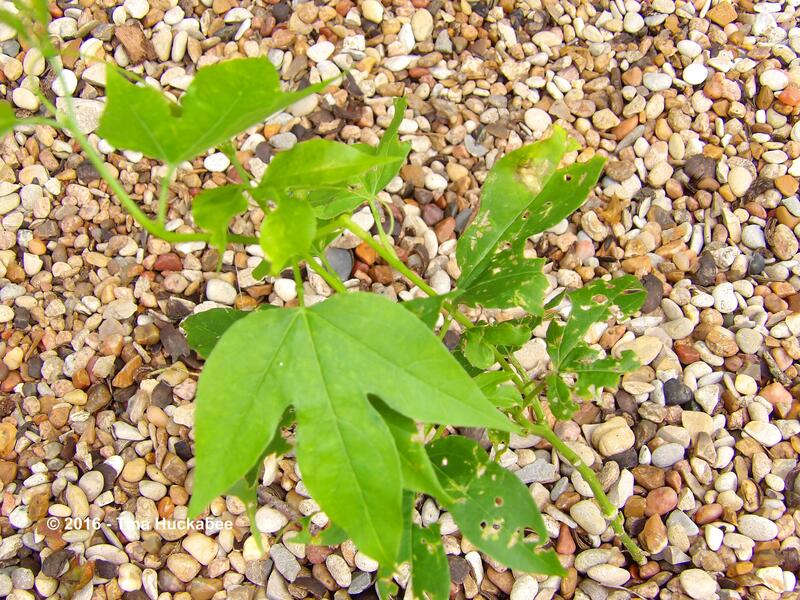 From a biological standpoint, that makes sense, because a host plant wouldn’t be much of a host plant if the visiting insect ate it to death–that wouldn’t bode well for either the plant or the insect. Nature is generally designed better than that. 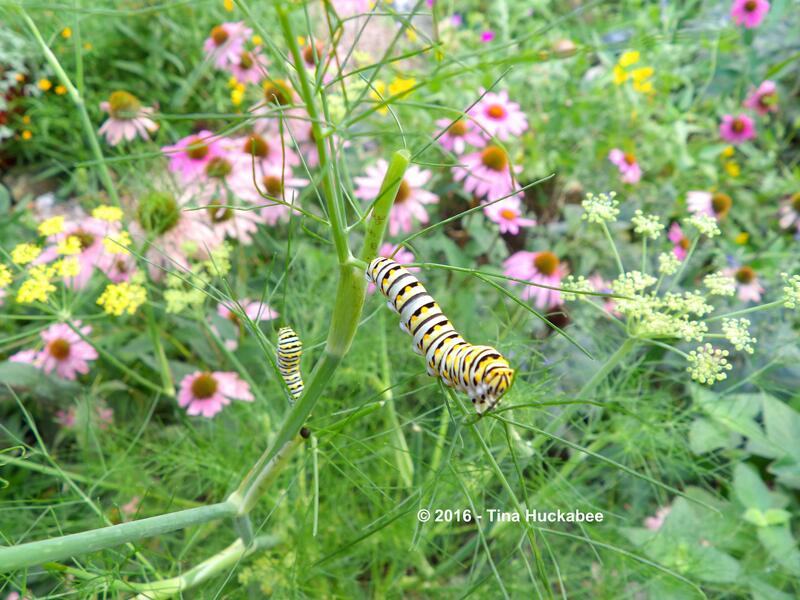 The only caveat in my experience is that if fennel (a cool season plant and NOT the native host plant for the Black Swallowtail) is decimated, and it’s an older plant, and the summer is truly blazing hot (reminder–I live in Central Texas), the fennel might succumb. But there is an easy fix for that: a four-inch pot replacement is about $2 at my favorite nursery. 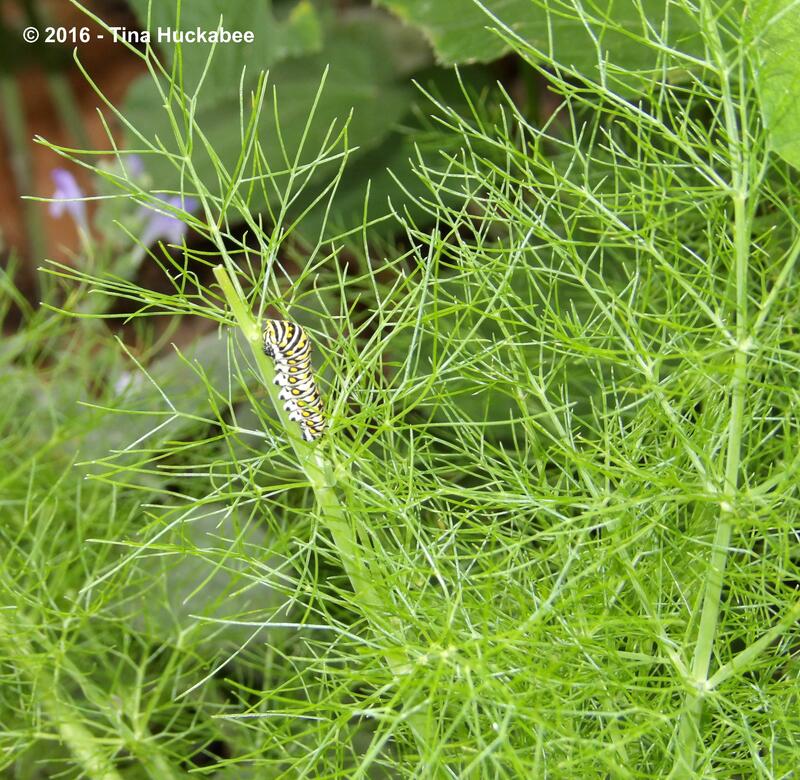 Also, as lovely as fennel foliage is for most of the year, I must be patient and understanding during the late spring/early summer and then again, in early fall, when the Black Swallowtail larvae are most active and therefore, the fennel isn’t in its best looks. I must recognize that the munched fennel will not add anything to accepted aesthetics of garden beauty. 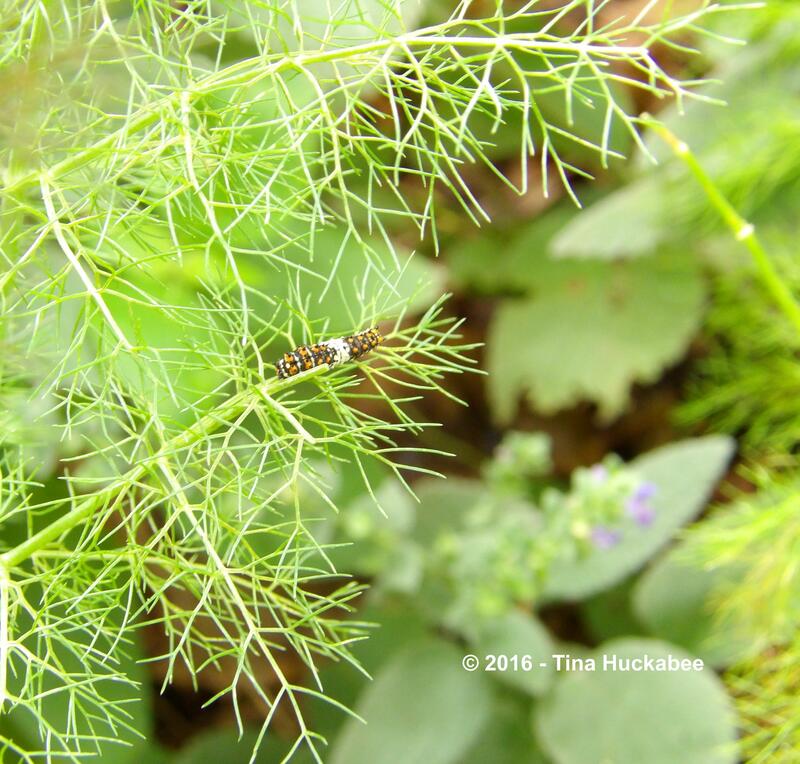 At that point, fennel has a more important role to play than as a just another pretty plant. 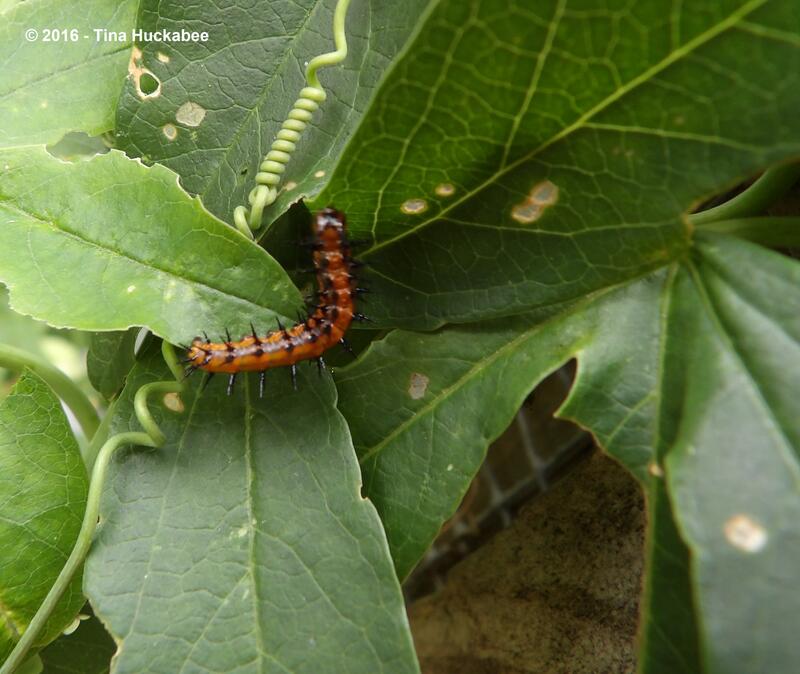 …are hosting the eggs and caterpillars of the Gulf Fritillary, Agraulis vanillae. …and in time, the butterfly is born. Gardening is neither an exact science or pure art form. 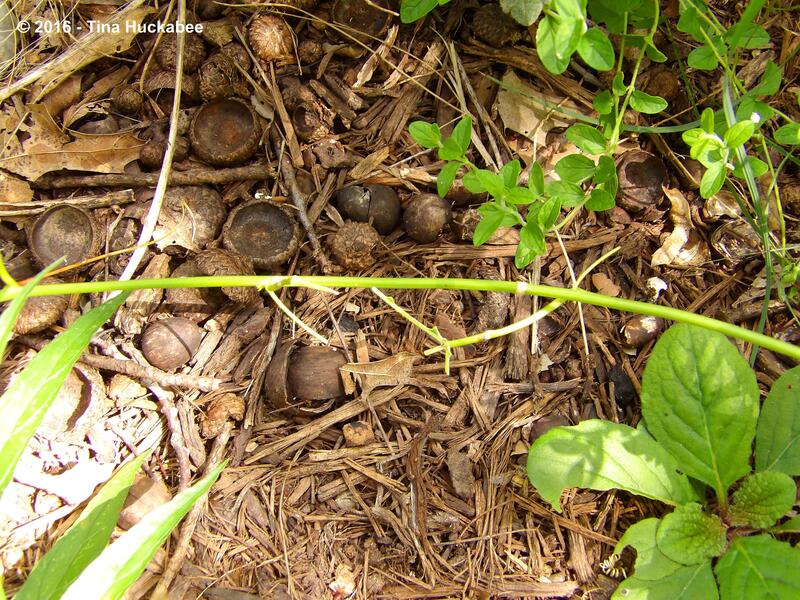 Gardeners must keep a keen eye on the garden for changes–good and bad–and for potential problems. While almost all insects (like moths and butterflies, as well as their larvae) are beneficial, there are the bad bugs that no one wants to see cozying up to their well-loved and well-maintained gardens. Obviously, we don’t want to allow tomato horn worms to careen through our summer tomato crops with abandon. Nor do most gardeners have much patience with aphids and other sucking insects. But let’s keep noxious insecticides on the shelf, or better yet, un-purchased, and let’s hand remove or water-spritz the bad bugs when necessary. A low maintenance insect management method will allow beneficial insects, pollinators especially, to thrive and to continue their work in our gardens and contribute to the health of larger world. Even if they do eat up our foliage! Whether your foliage is intact–or otherwise– join with me in celebrating foliage in the June garden. 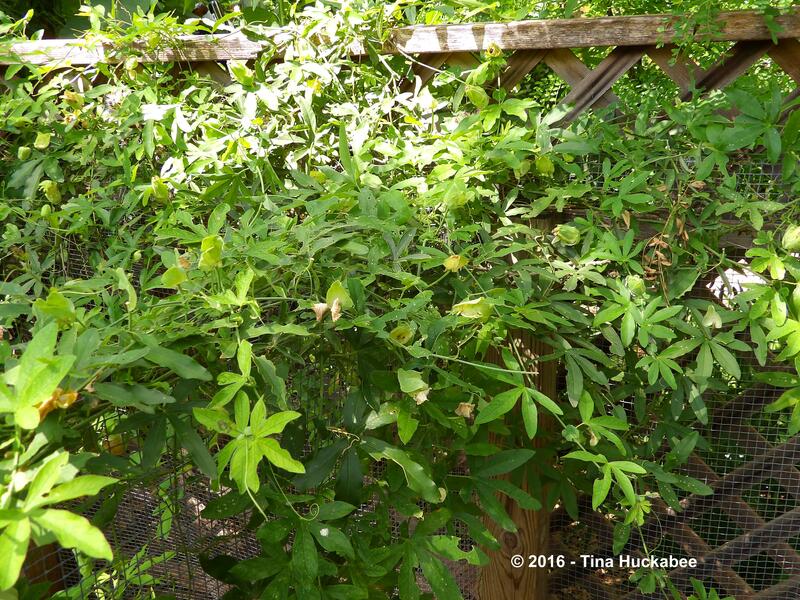 Thanking Christina and her lovely Creating my own garden of the Hesperides for hosting, check out her Garden Bloggers’ Foliage Day for a look at foliage in many gardens, from many places, and share your leafy loveliness, too! 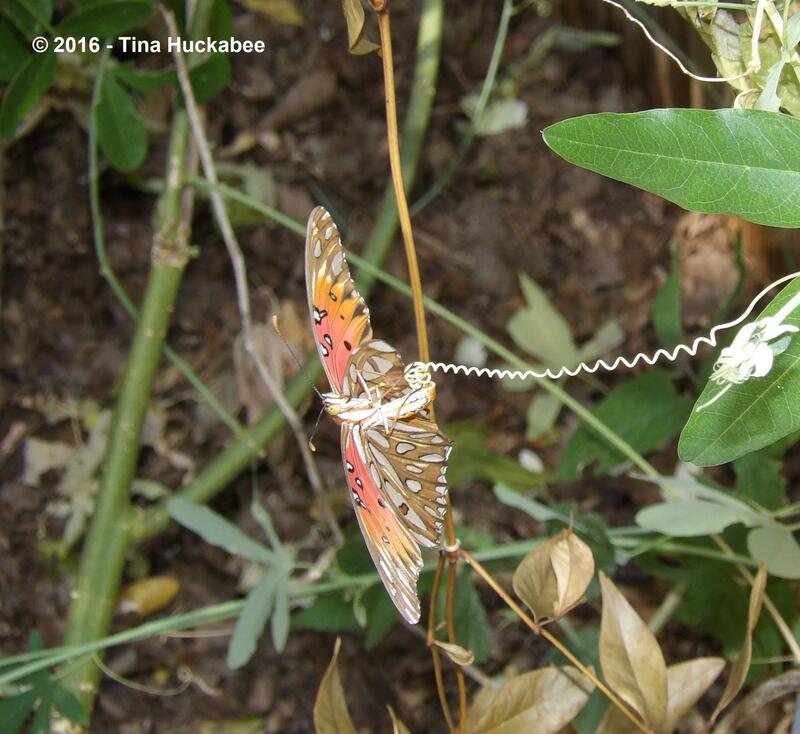 This entry was posted in Butterfly gardening, National Pollinator Week, Pollinators, Uncategorized and tagged Garden Bloggers' Foliage Day by Tina. Bookmark the permalink. Oh what amazing butterflies. If I could have such beauties in my garden, I wouldn’ t mind what they chewed. Thank you, Chloris. 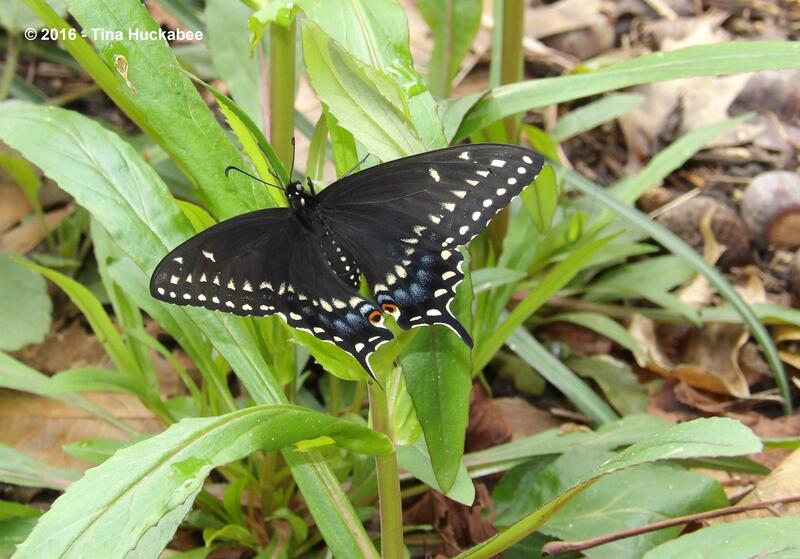 The photos of the Black Swallowtail are older photos. I’ve seen plenty of them in my garden this spring/summer, but they’re just flying too fast for me to get them. 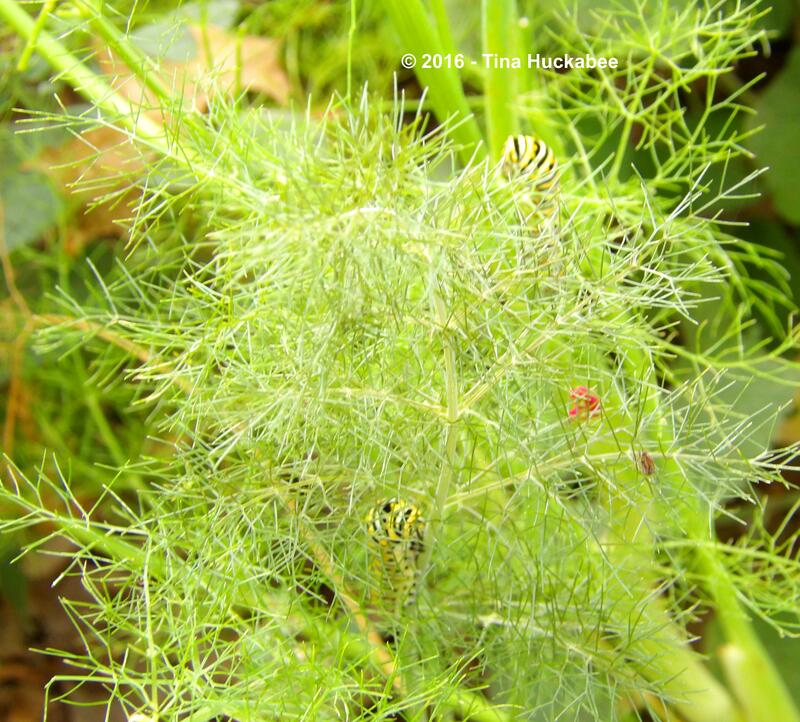 They are laying eggs though and eating fennel and I’m anxiously awaiting the emergence of several. As for the Fritillary, it’s very common here and I forget, until I study photos, just how beautiful they really are. What a fun post. in the hill country recently, I found an as-yet-unidentified beetle happily chowing down on the flower of a skeleton plant. He was so efficient I was able to watch him pull down petals and stamens and slowly reduce the flower to a skeleton of its former self. You’re right: nature knows what she’s doing, and what we call damage helps to sustain life. Amen, sister! As long as the balance isn’t bothered, things usually work out just fine! Brilliant variation on the usual idea of a foliage post. I agree that if we want a garden in harmony with the environment we must accept some damage to our foliage. 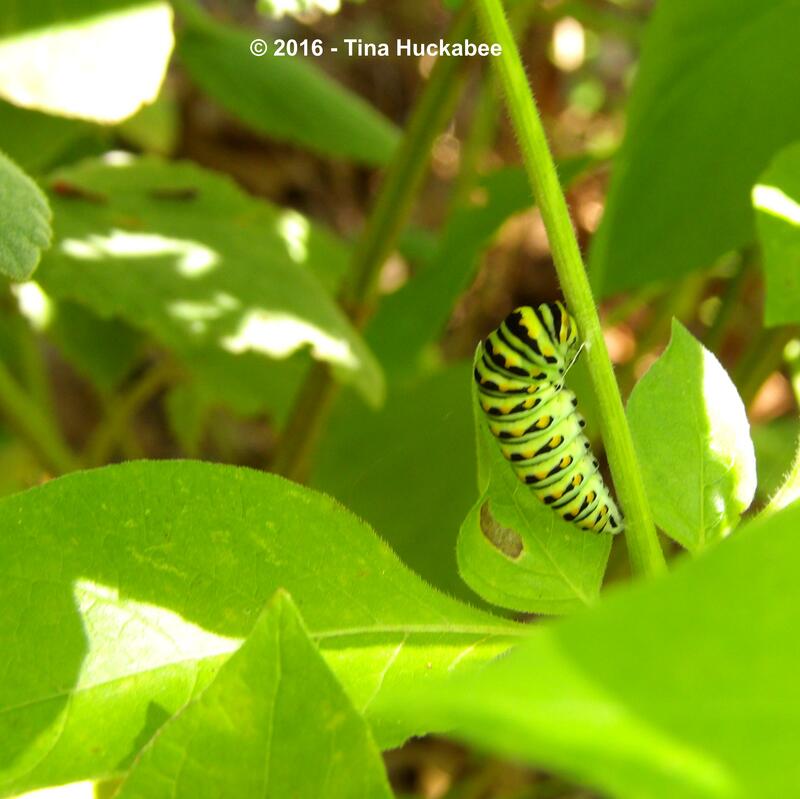 Your swallowtail caterpillar is almost identical to the swallowtail we have here although your black version isn’t known here. Thanks for joining GBFD with this useful reminder of what foliage is for! Thanks, Christina! 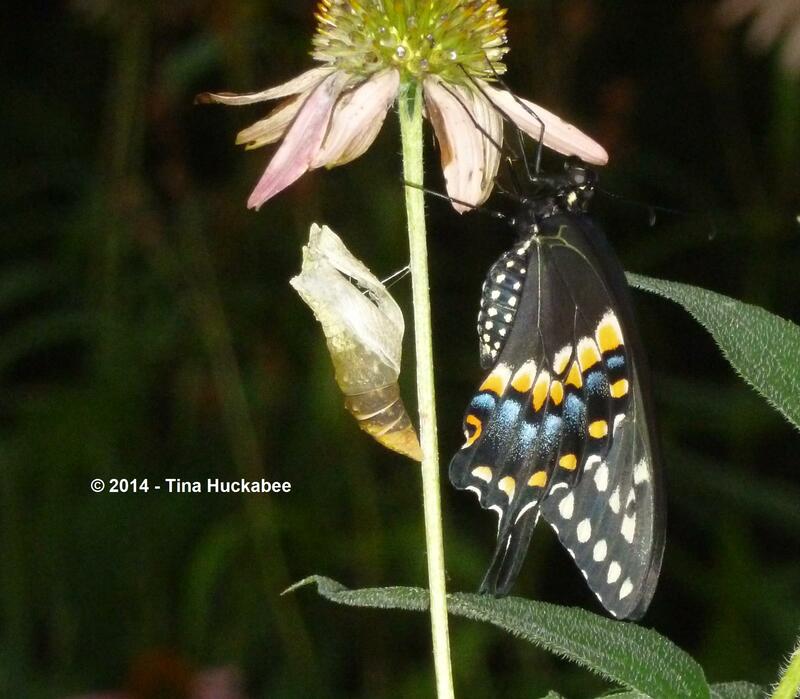 Interesting the similarities with the Swallowtails. The Black ranges throughout North America–it’s fairly common. Thank you for hosting–this was a fun post to write! I am going to have to buy some Fennnel. I have not had many butterflies in the garden for years. 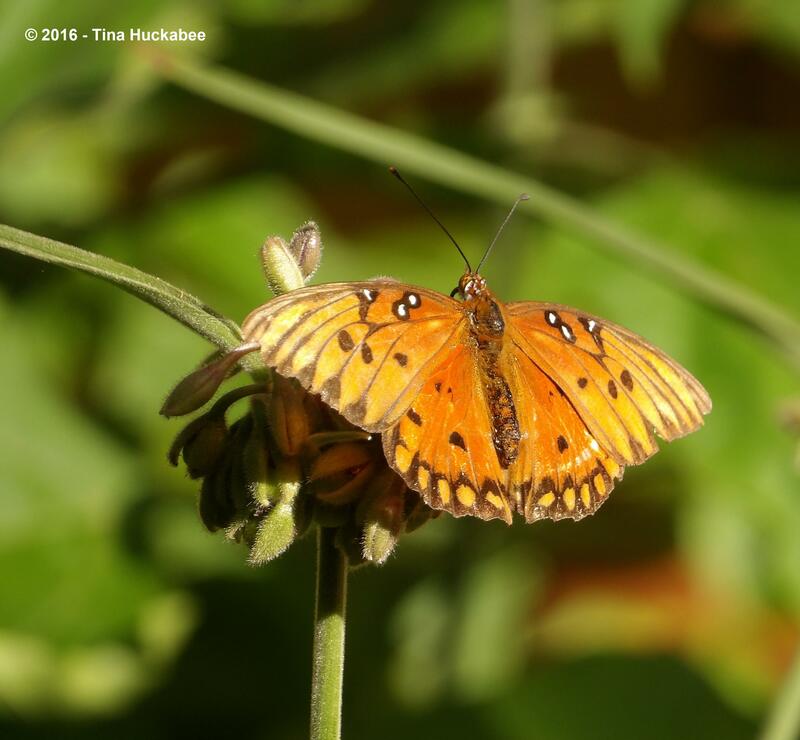 My yard used to be full of Gulf Fritillary and now I rarely see them. I’m glad they are still strong in your part of Texas. You’ll have to wait until fall (September) to get fennel, I’ll bet. It’s just too hot now to put some in. It’s really a great plant: beautiful as a winter evergreen and a great wildlife plant. Interesting about your Fritillary–obviously they must not have enough of the passion-flower species, but I wonder why, as your winters are mild. Hmmm. We actually have the wild Maypop passion flowers growing all over the area and many people grow the ones from nurseries in yards, including me. My Dutchman’s Pipes used to be nearly completely eaten by Swallowtails. I volunteer at a botanical garden and there are less butterflies there too. I just don’t know. Maybe the butterflies are just elsewhere now. Well, that is interesting–and disconcerting. I know a few years back, it seemed like I never saw a butterfly, but they’ve made a bit of a comeback. Perhaps your area is in a down cycle. I suppose that’s possible. Keep planting for them and you probably have other pollinators too. Thank you, Tina. A wonderful post! Your photos are great and like you I love butterflies. 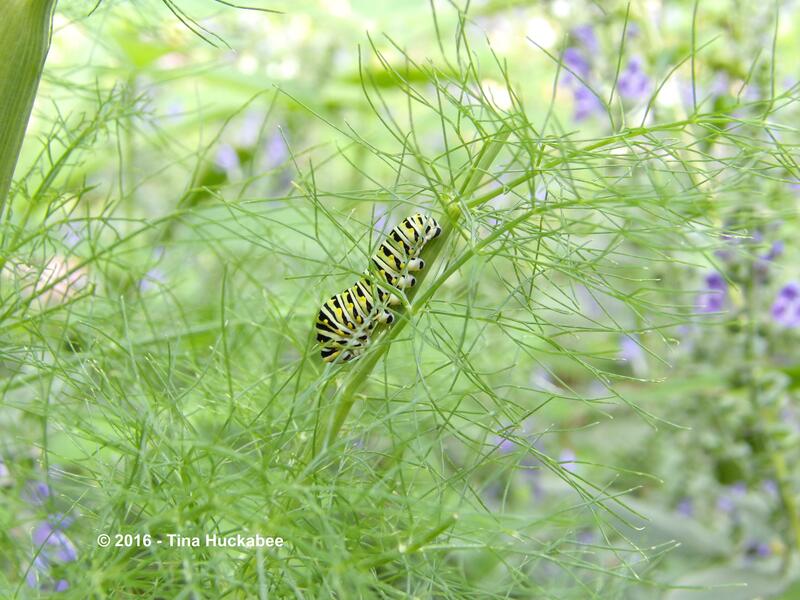 I also have fennel for the black swallowtails. The one problem I have with fennel is that is spreads everywhere. I do not want my butterfly bed (or the rest of my garden and lawn) to be all about fennel, so I’m pulling the newbies every chance I get. And now that I know how invasive it is, I’m cutting the flowers as soon as they develop. I’d like to leave them for the insects, but that has turned into a lot of additional work. Have you had that problem? Not at all. I live in Central Texas (Austin) and don’t water all that much, plus it’s not a wet climate, so, no issues with fennel seedlings. I know in Oregon (specifically Eugene, but probably also Portland), fennel is a big no-no to plant. It’s a damp and very inviting climate and fennel has proven to be a big problem. I guess that’s one advantage to living in Texas–it’s dry enough, often enough, to not present a problem. At least, with some plants that’s true. I also don’t typically let the fennel go to seed. That helps, too. Well, they’ve got to eat, too. And I wonder how we’d feel about them if they weren’t beautiful? If butterflies, for instance, had no wings. They’d just look, to most people, like regular ‘creepy crawlies’. But I’m glad they are the way they are, because they sure brighten things. (Oh and I love caterpillars too!) Lovely post and particularly your photos, Tina. Thanks, Val–I so appreciate your compliment. I think your point about how we’d feel if they weren’t pretty is actually a really good one. 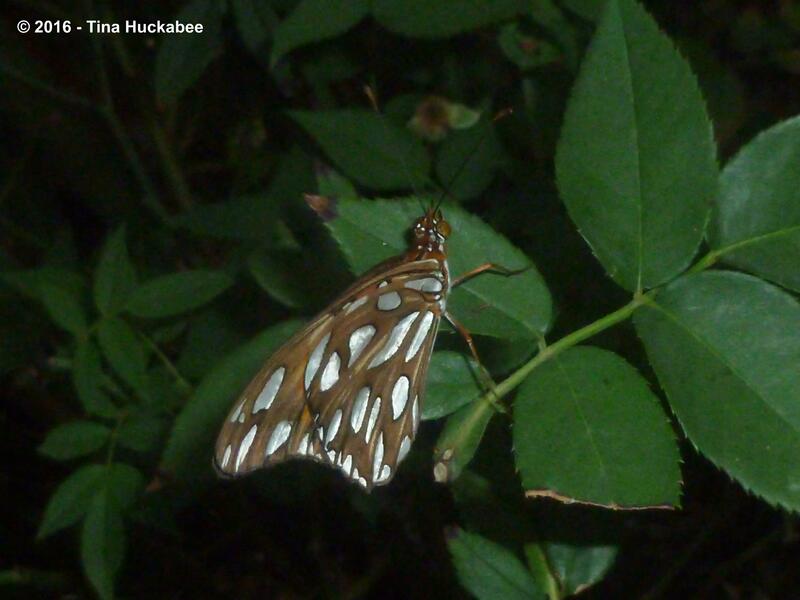 Moths, for example, aren’t as beloved as most butterflies, and yet, are also very important pollinators. Bats too–not as lovely as hummingbirds, but absolutely vital pollinators in many parts of the world. (For the record, I adore bats. So cute!) But you’re right, the cats and the adults do brighten up the garden. Gorgeous ! A beautiful post . Such very good advice! 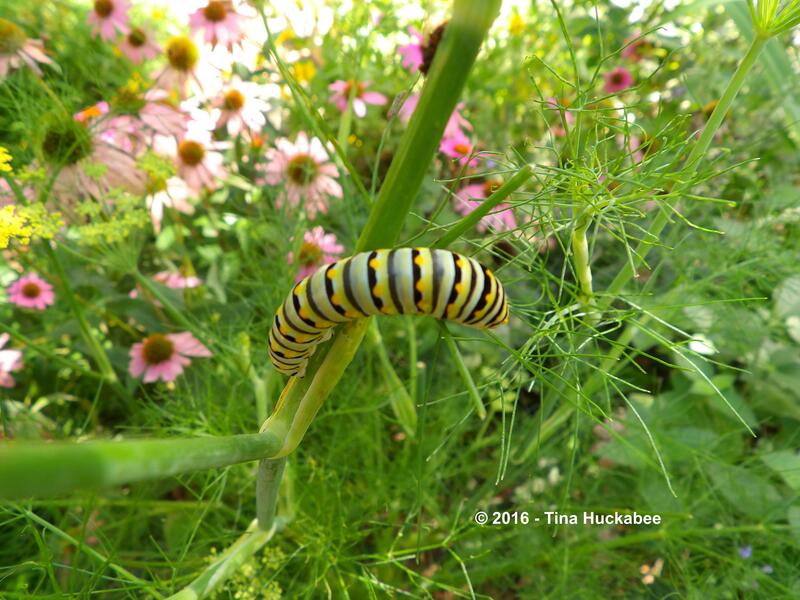 I planted dill from seed this year for the Black Swallowtails. I’ve yet to see a caterpillar or butterfly on it, but it’s available for them if they travel through. The Tiger Swallowtails are plentiful this year, but that’s not surprising as the neighborhood and the garden are full of their various host plants. I’m hoping to see a Monarch here soon. I have seen them in the area, but not in my garden yet. Lovely photos of all the caterpillars, chrysalises, and butterflies! Thanks, Beth. I’ve never had much luck with dill–the fennel seems a little hardier in our hot summers than the dill. I’ve only seen one or two Tigers, but they float through my garden, apparently on their way somewhere else. I’m still seeing the occasional Monarch–odd for this time of year. I do like this post. It demonstrates that your garden is truly a living organism, not sterile. Good for you, we need more people who have a real understanding how nature works. By the way, we say a squirrel munching on one of our fig tree leaves. I have seen them eating some strange (to me) stuff lately, but my theory is that it was just trying to distract me from the fact that it had just been at one of the bird feeders…. Thanks so much. I’m baffled at the attraction (at least, here in Texas) of the sterile turf-heavy “yard”. I’ll never understand folks who drive out in the “country” to see wildflowers, when they could have them in their own space with no more effort than the sterile grass requires. As for the squirrel–I’m sure you’re correct. They’re clever little things, aren’t they? Great post! When your plant leaves are munched on, then you know you’re doing something right. Our fennel is loaded with eggs right now, so if all goes well, it will be nothing but stems in a few weeks. I’m looking forward to that. Thanks and yep, you’re correct! How exciting! Do post, especially if you get to see the butterflies emerge. I was lucky to see one yesterday morning–so lovely! Tina qué mariposas más hermosas. 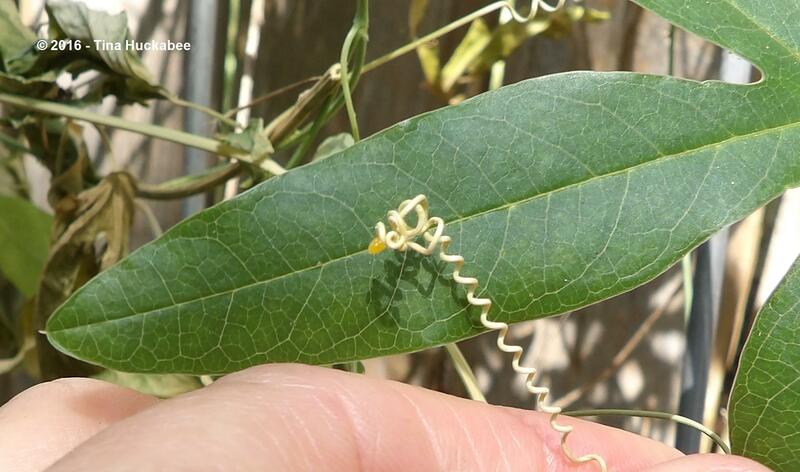 Da igual que sus larvas coman unas cuantas hojas con tal de que se conviertan de nuevo en esas maravillosas mariposas. Las plantas se podan y crecerán de nuevo. Gracias por cambiarnos la forma de ver la jardinería Tina. Saludos de Margarita. Thanks, Margarita. I think we do need to see gardens and gardening as for the pollinators and other insects, rather than some perfect “art” form. Nature already has the perfection of balance and that should be good enough! Es cierto. La Naturaleza es sabia y si tenemos variedad de plantas de todas las clases no hay plagas. Sólo unas larvas de mariposa hambrientas¡¡¡¡¡¡¡¡¡¡¡¡¡¡ Saludos de Margarita. It takes courage to let things run their course. My fear is that an infestation will be so severe that the plant will die. Err, I used to think that until I went to a master gardener talk where the speaker said something kind of revolutionary. Basically he said that if a plant can’t survive a certain location fro whatever reason it is the wrong plant and your efforts are wasted. It will always be weak and a PITA. Replace it. 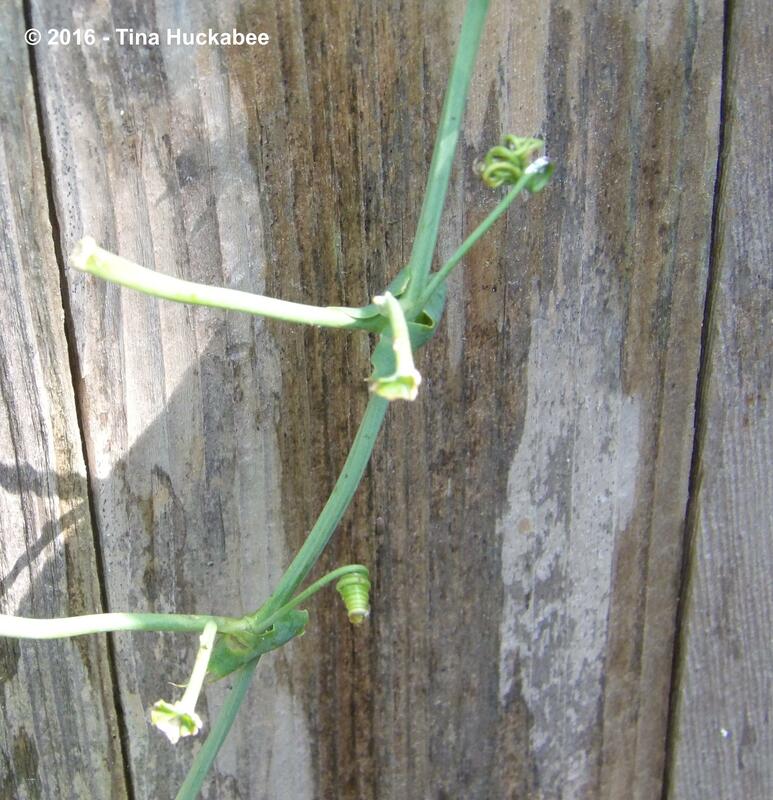 And you know … most plants do seem able to push past being eaten. The leaves might be gone for a short time and then new ones grow and often more abundantly than before. I used to have the same fear, but finally, just let nature take its course. You know what I learned? That appropriate plants will survive and usually thrive. And your master gardener was correct: if you have to baby a plant, it doesn’t belong where you have–yank it out!! Excellent gardening philosophy, and excellent post explaining it! We need more of this, thanks. Thank you, Hollis–I’m happy to oblige! That’s what it’s all about! I get so frustrated when gardeners take out the wildlife factor of gardening and threat them like their own personal fiefdoms. 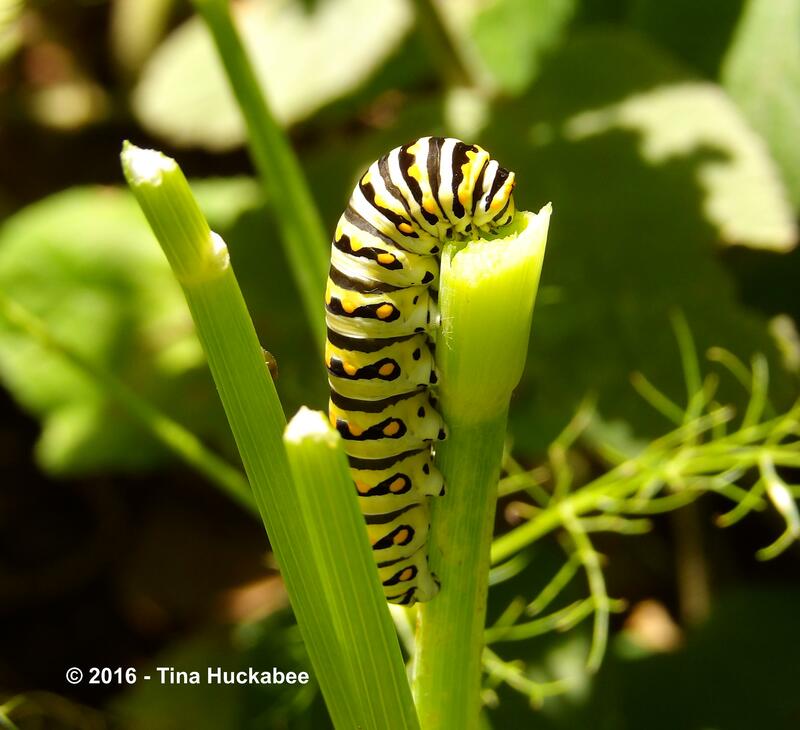 If my butterfly larvae plants AREN’T eaten, I get worried! Yes! While a garden is art, it’s also and primarily, a ecosystem and should be treated as such. I can’t imagine how long you’ve been gathering those amazing photos. 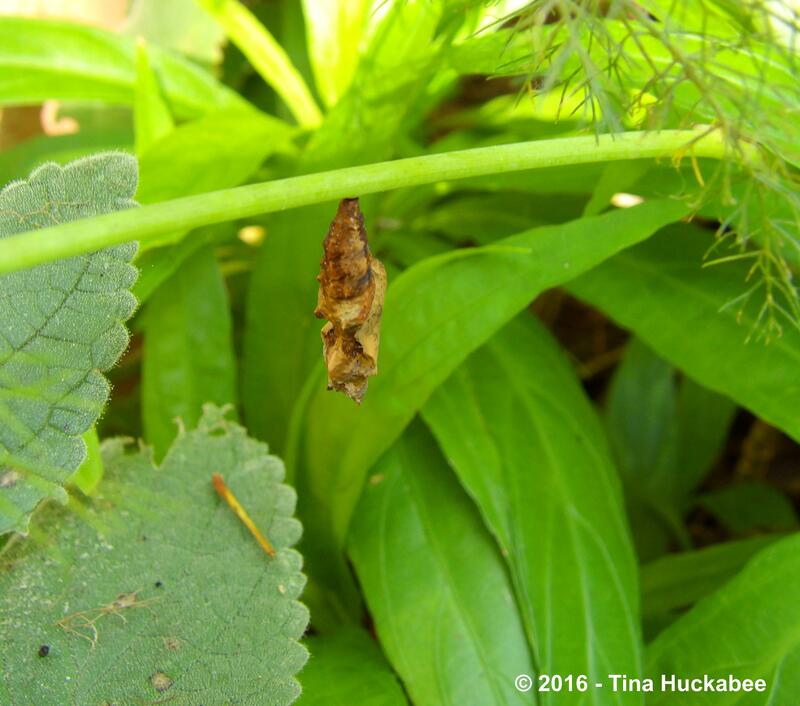 I rarely see a chrysalis, they are so well camouflaged, and here you’ve caught several different types, along with newly emerged butterflies. Such dedication to the craft of not only supporting them, but raising awareness. I am a bit awestruck, truth be told. I take the point raised by Debra’s comment to heart these days. If a plant flails it is not my job to force it to survive, but rather to find something that will be happy in that spot without babying. It certainly takes some of the sting out of losing plants and relieves me of the burden of even thinking I can “control” for gardening success. I can observe and choose wisely (or not so wisely), but these spaces here are not “mine” and are certainly not “under my control”! 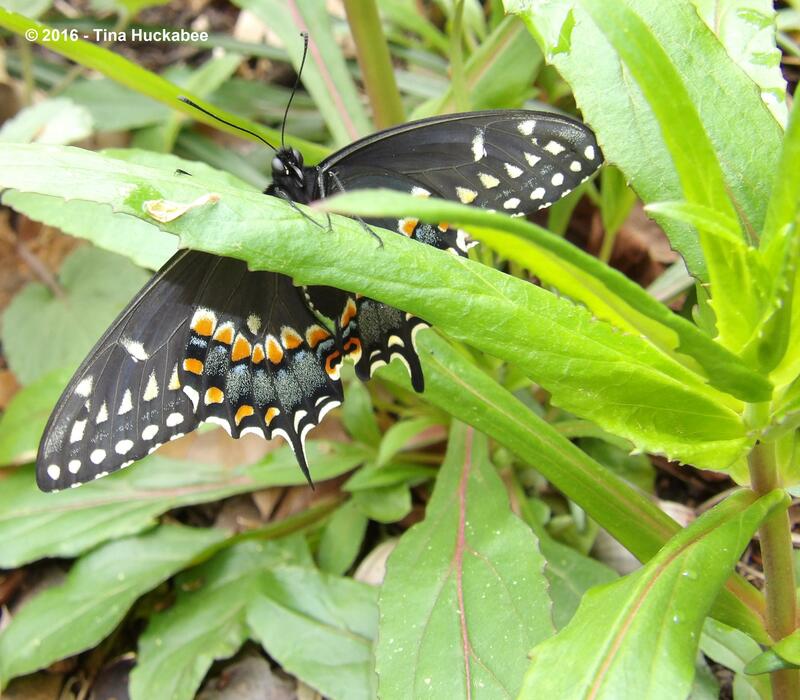 The photo of the just-emerged Black Swallowtail is older, though I observed one emerge this week–coming to a Wildlife Wednesday post soon! Funnily enough, I found the Gulf Fritilliary chrysalis when I was looking for Swallowtail chrysalises. 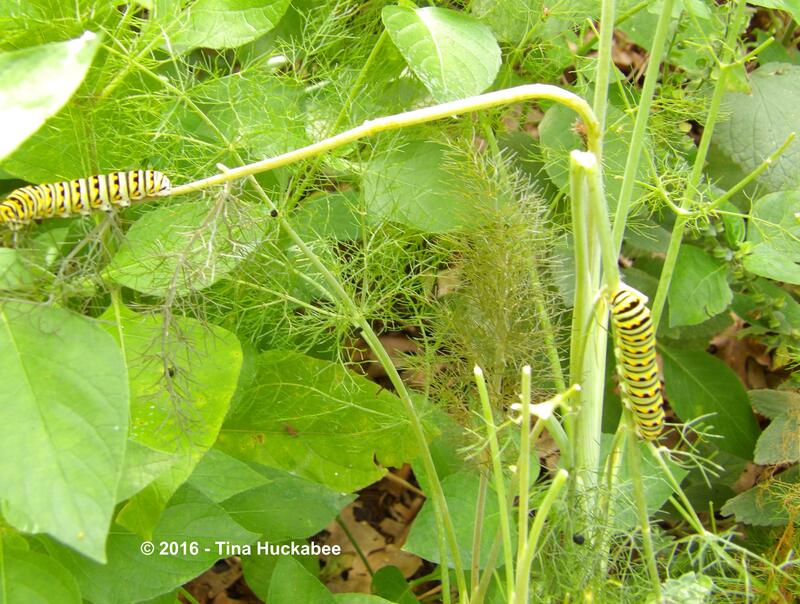 That caterpillar traveled a bit, because the passion vine that I’m certain it ate is nowhere near the fennel that it settled on.